Horze is a style and color-conscious company. Check out their site -- whether you are a flamboyant fashionista or a conservative dresser, you'll find things to love on Horze.com. 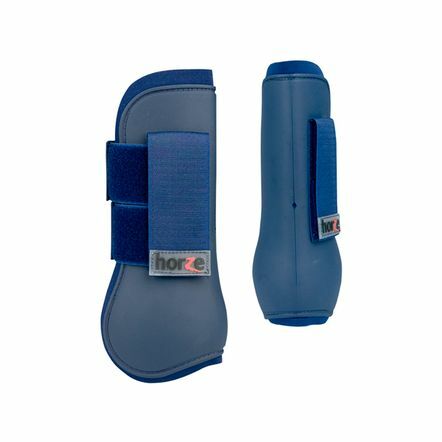 These Horze tendon boots come in twenty (20) colors -- and not the standard navy and forest green -- they have ginger and four shades of blue, taupe, pearl, pine bark, chili pepper red, and more. They sent me a pair, and I'm impressed. They are sturdy, well-made, and easy to apply. At $26 they are a bargain. Horze is offering a giveaway of the navy boots shown right -- to enter, just leave your contact info in a comment and like the Horze Facebook page. I could use some boots! These are great boots. 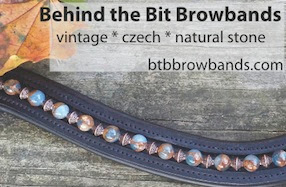 I have honestly not heard of the Horze brand until this year and now have several of their products. So far the quality is great and you cannot beat the price. kailabalesdent@gmail.com :) Good luck everyone! Very nice, conservative yet stylish, just the kind of boots I would use. I liked the Facebook page. My email is myfarmerlife@gmail.com. Now I'm going to go look through all of their stuff. I've heard of the company but I don't think I've ever looked them up!